I’m currently working on book three in my PERFECT SERIES. 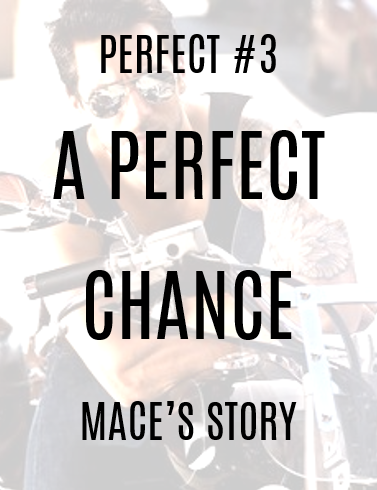 A Perfect Chance, (Perfect #3) releasing May 2016. Drowning in darkness, Mace struggles to move on from a past filled with sorrow. Anger is a much easier emotion to handle, one he readily embraces. Burying himself in his agency work and spending his nights with his brotherhood of bikers, Mace is determined to spend his life playing by his own rules. Accustomed to a family of brooding men, the last thing Lena wants is another one in her life. Desiring nothing more than to break free and start afresh, she’s plagued by her own guilt. Reluctant to put those she cares about through more upset, she’s left frustrated and stifled. Also in the works is part two in The Gift series, Blood Change. This will continue to follow Lexi’s paranormal journey. Still in the works is also Changing Moon, A paranormal romance, and you’ll also discover more of the Denton Wolves, who you met in Pull of the Moon, my 20k short in A Very Werey Christmas.